Get a wealth of delay effects, plus so much more. BIAS Delay Pro lets you quickly and easily design thousands of custom delay pedals from scratch. Seamlessly integrated with BIAS Pedal Delay for mobile and desktop, BIAS Delay Pro travels effortlessly between studio and stage. And of course, it’s ToneCloud-ready. Upload and share your unique delay pedals on the ToneCloud social network for guitarists, and download thousands of unique delay pedals from fellow musicians around the world. BIAS Delay Pro uses only the finest quality components available. The road-ready metal foot switch, the circuit board, and each knob used are all top of the line. Enrich your pedal tone with the absolute best sound quality analog and digital has to offer. 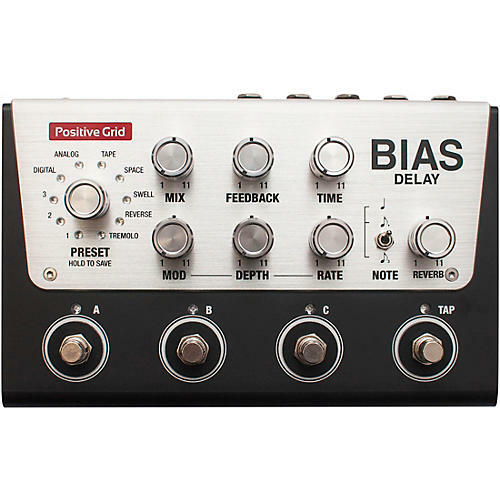 BIAS Delay Pro seamlessly integrates with your BIAS FX mobile and desktop effects arsenals. It automatically imports your custom delay pedals into the BIAS FX pedalboard’s dual signal chains with dual BIAS amps. It also includes all of BIAS Pedal’s stock goodies, including Amp Room: six guitar amps from the rockin’ BIAS Amp to blow through. Because BIAS Pedal is expandable, it’s a platform for more than just delay and distortion pedals. More pedals are on the way. Positive Grid is all about building a complete musical war chest for guitarists in one integrated system. BIAS Delay — insane delay pedal customization, infinite tonal possibilities and thousands of downloadable pedals at your fingertips.